Recently I was talking to a friend who reads intensely, but has no interest in or knowledge of publishing. He’s a coder, who reads a half dozen non-fiction books a week. This is the kind of reader the industry needs. He’s also the kind of reader who until last year bought ebooks and print exclusively from Amazon. Now he doesn’t even look at their site. Why? My friend liked to use Amazon’s bestseller lists to find new reads in specific categories. But now, my friend says bluntly, those lists are full of crap. 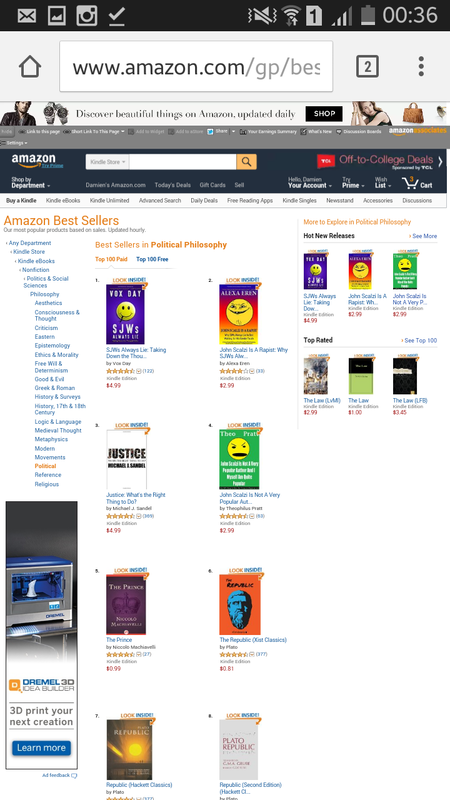 Above is a screencap of the category bestseller list for Political Philosophy from Amazon.com. And low, it is indeed full of crap. With #1 #2 and #4 positions occupied by a series of pamphlets that amount to nothing more than an internet flamewar being played out, not on some obscure forum, but on Amazon’s bestseller lists. And I literally mean that these “books” are just long blog comments reformatted as ebooks. They have ZERO content of any interest to an actual reader looking for works of Political Philosophy. Nothing. Zip. Nada. Theodore Beale hates John Scalzi, so he wrote a very long list of ways in which he has been wronged and published it as an ebook. Alexandra Erin found the thing so hilarious she wrote a parody and published it. Fans of Beale published a response. The outcome? Three totally inconsequential works of nothingness occupy the top spots on Amazon’s prime marketing space. Imagine a reader who knows nothing of the Beale / Scalzi argument – which is basically everyone in the world except about 300 scifi fans – buying any of these books. What will they make of “John Scalzi is a r¢$^¥t?” Who knows, but I think its fair to say there’s a major risk they won’t buy from Amazon again. There’s a lot of information in the world, most of it junk. We all need sources we can rely on to show us the rare non-junk info. While Amazon is competent at selling ebooks, it has completely abandoned any effort to help readers find quality information. It’s bestseller lists are so easily gamed that a clique of crazy scifi fans have hacked all the top spots without even trying. That’s a serious chink in the armour of one of the world’s most powerful businesses. And it’s losing them the attention of readers like my friend. I buy ebooks mainly from Apple and Google Play. I’m impressed that your friend works as a coder and reads 6 books a week. Wow! I’m really doing something wrong. Nice blog. Thankfully for Amazon a large number of its customers are gullible morons.